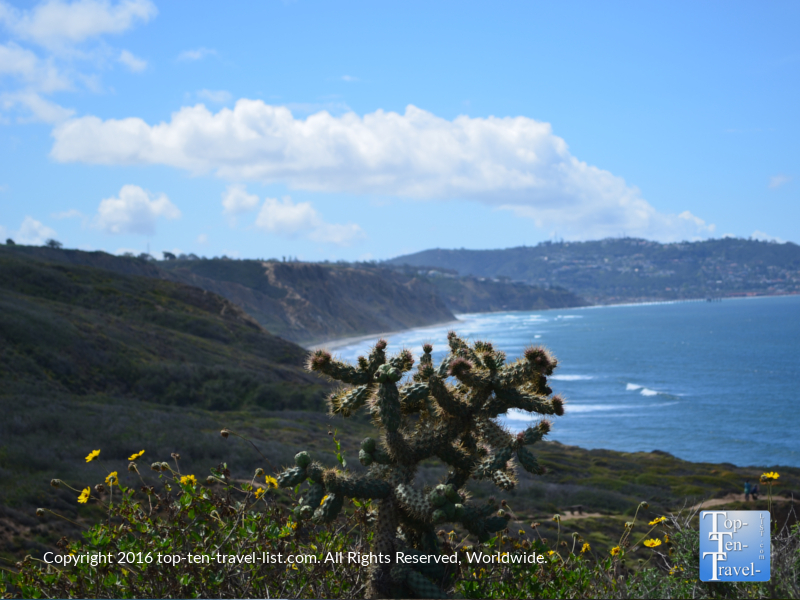 Hiking Hotspot: Torrey Pines State Nature Reserve in San Diego - Top Ten Travel Blog | Our experiences traveling throughout the US. 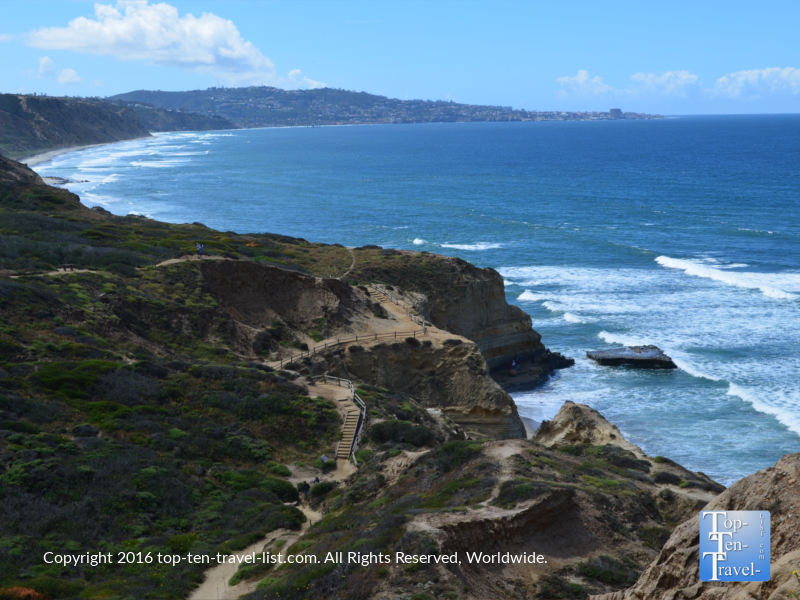 San Diego is most well-known for its’ beautiful 70 mile long coastline which is lined with a diverse selection of gorgeous beaches. 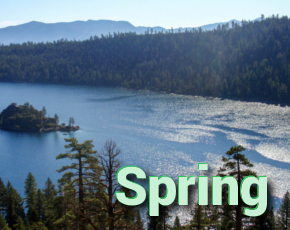 With year-round sunshine, mild weather (average temps are in the 70’s), and an abundance of fitness activities, it’s no wonder so many flock here each year. However, there are more ways than one to enjoy the water. Besides the popular go-to beaches, hiking is a great alternative way to take in the beauty of the Pacific. 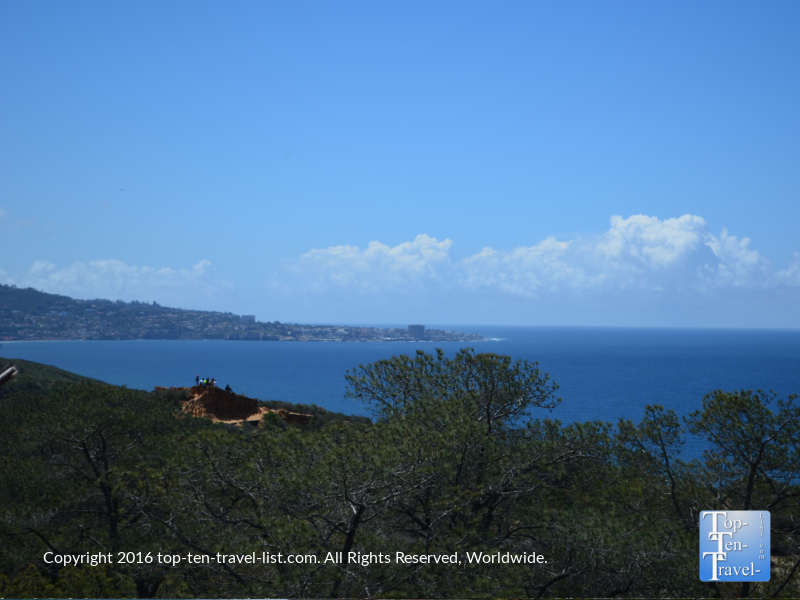 Hiking allows you to enjoy the picturesque views of the coast while also getting in a nice little workout for the day. 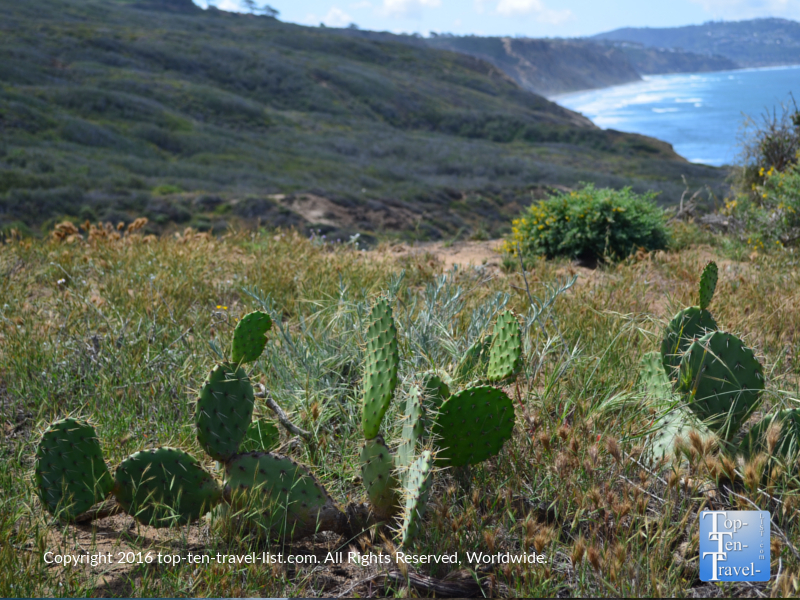 Torrey Pines State Nature Reserve is a beautiful wilderness area offering a few easy nature trails where you can take in breathtaking views of the coast and also enjoy the native plant life. 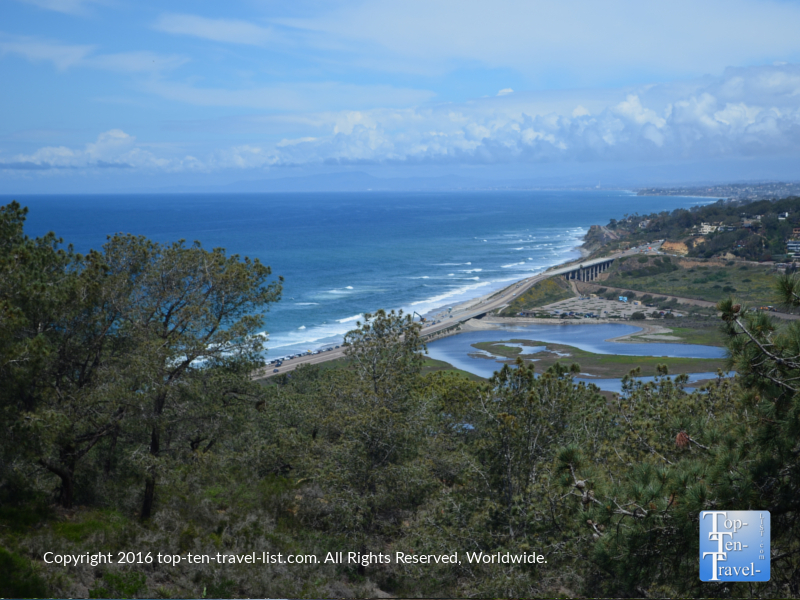 Torrey Pines is named after the Torrey Pine tree (Pinus torreyana), an endangered species which only grows at this reserve and Santa Rosa Island in Santa Barbara. Pictured below is one of many cactus varieties, the prickly pear. Trails are short and easy enough that even casual walkers can enjoy the area’s beauty. 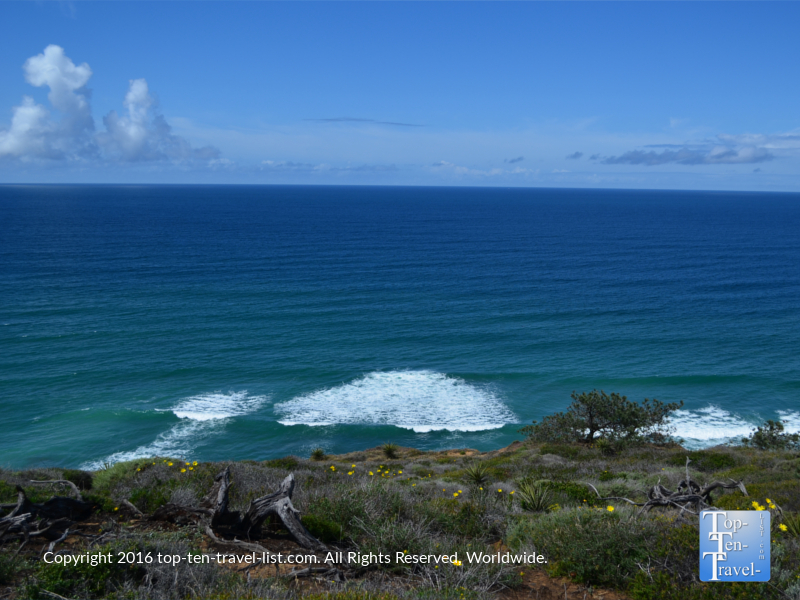 It’s definitely not a rough and tough hiking area, rather a peaceful place to enjoy some time in nature while soaking in San Diego’s stunning coastline. Check out a few pics below of the amazing scenery along the trails! 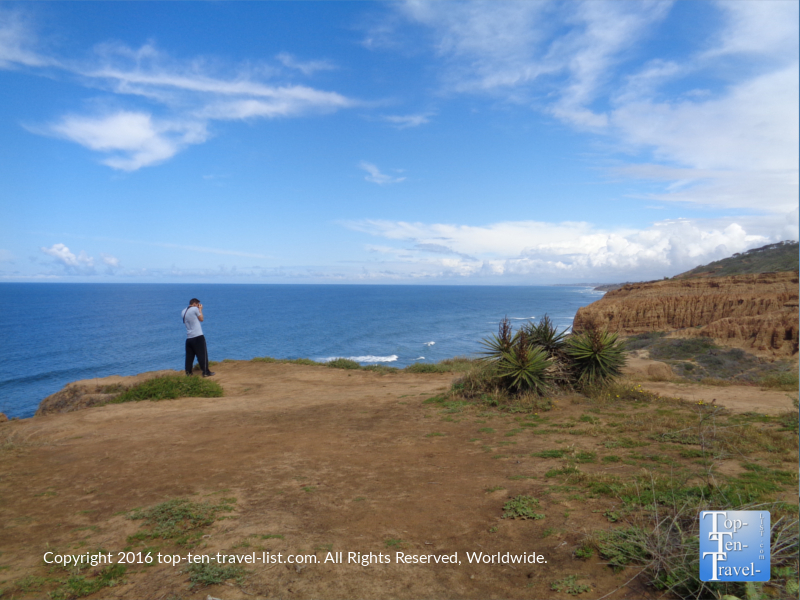 Highlights: Views of the coast and sandstone formations. Wildflowers in the spring. Highlights: Sees less traffic than the other trails. More of a workout if you are a fitness buff. Nice views of the coast and interesting plant life along the way. Highlights: Views of the gorge and badlands. Lots of wildflowers in the spring. 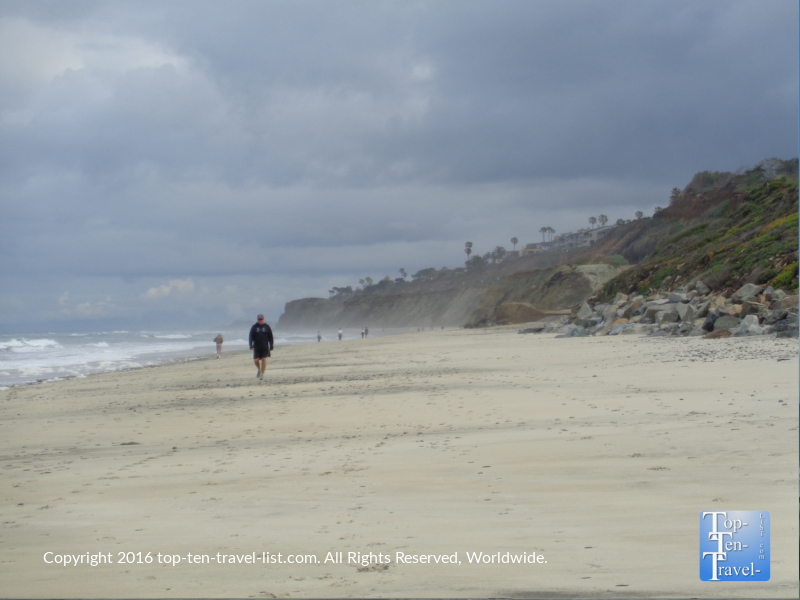 Highlights: Access to the beautiful Torrey Pines State Beach. 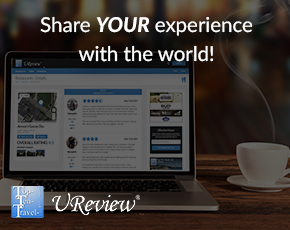 Highlights: Scenic overlooks and access to the beach. So, do yourself a favor the next time you visit San Diego and take a few hours out of your day to visit Torrey Pines. 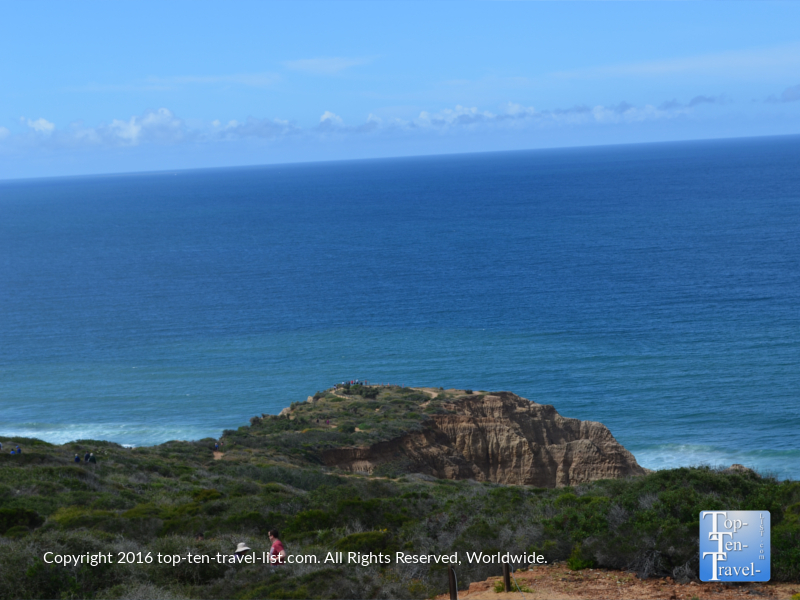 The amazing coastal views, beautiful rare plant life, and opportunity to exercise in such an incredible setting make it an easy addition to any San Diego vacation itinerary. 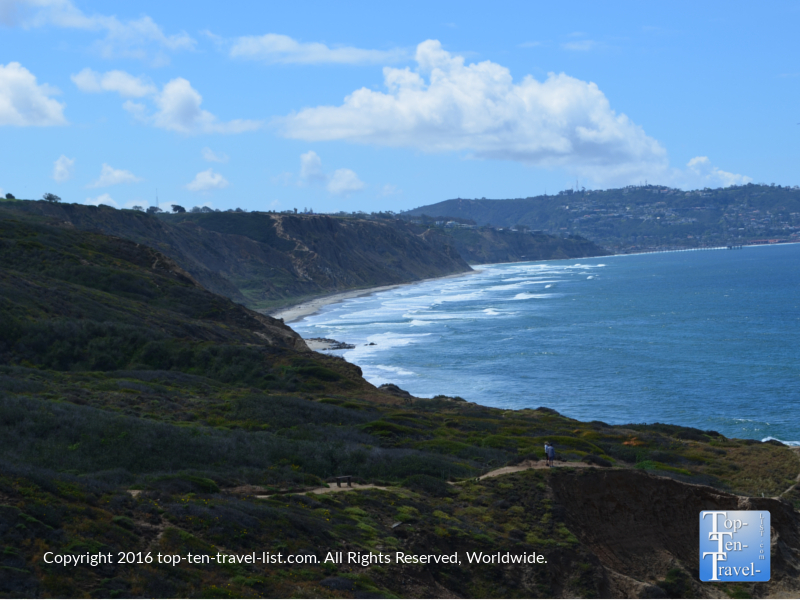 Torrey Pines is a fantastic destination to get in your exercise for the day (who needs a gym in an area this beautiful?) while still being outdoors enjoying the beauty of San Diego. 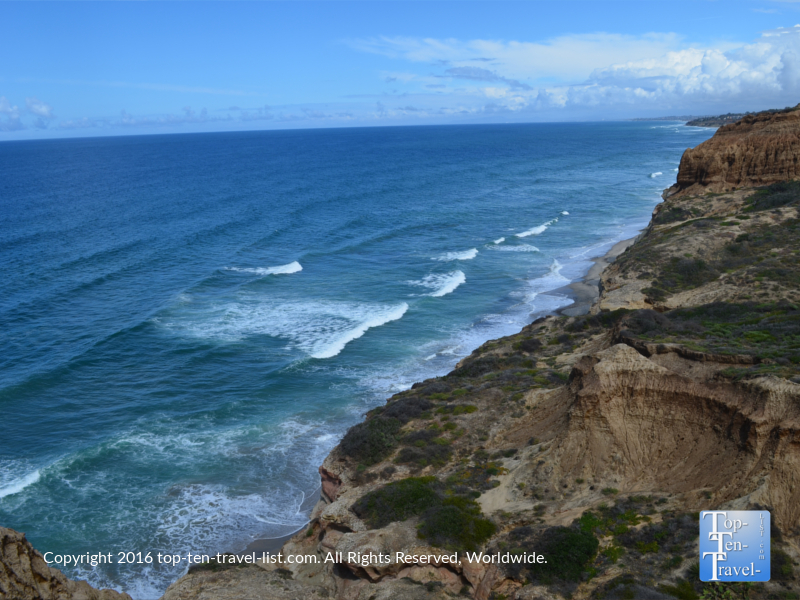 Torrey Pines State Nature Reserve is located at: 12600 N Torrey Pines Rd, La Jolla, CA 92037. Hours are 7:15am-sunset. The Visitor’s center opens at 10am. Parking is $12 in the off-season and $15 during the prime season. 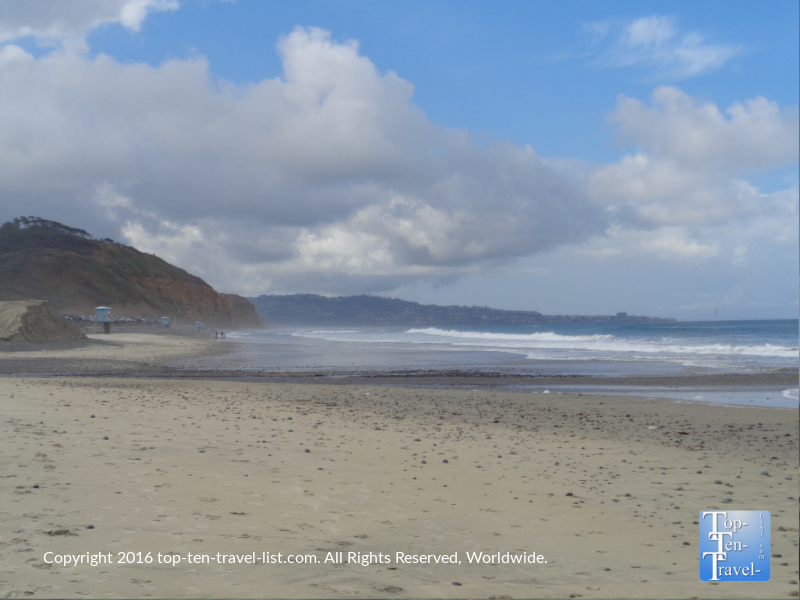 You can find free parking near the beach on Torrey Pines Rd. if you arrive early enough, although you must be prepared for a long and challenging walk up a huge hill.